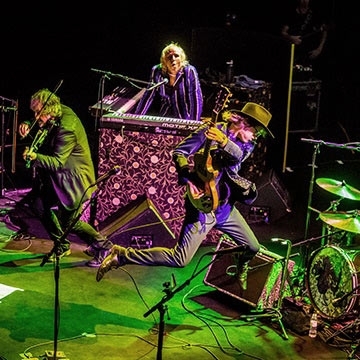 The Waterboys are a rock band originating from Edinburgh, Scotland, formed in 1983 by Mike Scott. The line up, location and style of the band has changed over their long career yet there has been a consistent mixture of celtic rock with traditional rock & roll. Their music has never ceased to evolve, from the influential mix of Celtic, gospel, country and rock on the classic Fisherman’s Blues, the fired-up poetic passion of 2011’s An Appointment with Mr Yeats and 2015’s acclaimed return to prominence, the rootsy, funky Modern Blues to their latest album (their 12th and first double album), Out of All This Blue, which is maybe the most brilliantly daring and accomplished reinvention of The Waterboys to date! Out Of All This Blue, The Waterboys' 12th and first double album is maybe the most brilliantly daring and accomplished reinvention of The Waterboys to date. Mike and fellow travellers, fiddler Steve Wickham, Muscle Shoals bass legend David Hood and Deep South keyboard wizard Brother Paul, play like demons on a mission. But it’s Scott’s use of hip hop recording techniques - drum loops, samples and found sounds that ground the songs’ soulful awakenings - that gives the album a particularly thrilling momentum.